Place lentils in a medium-sized saucepan with 4 cups water. Bring to a boil, reduce heat, and simmer until lentils are tender; about 20 minutes. Drain lentils and set aside to cool. Spoon lentils into a food processor and pulse several times until most of the lentils have broken down but are not completely smooth—you want the lentil mixture to be slightly chunky. Add oats, sun-dried tomatoes, walnuts, garlic, mustard, cumin, salt, and black pepper; pulse until well combined. Gently stir in goat cheese. Form mixture into four equal-sized patties and chill for 30 minutes. Build a medium-hot fire in a charcoal grill, or heat a gas grill to medium-high. Brush burgers and grill grates with oil. Grill burgers for 4 minutes per side, or until they've developed a crispy crust. In a bowl, mash the avocado flesh. Stir in yogurt, lime juice, chili powder, and a pinch of salt. 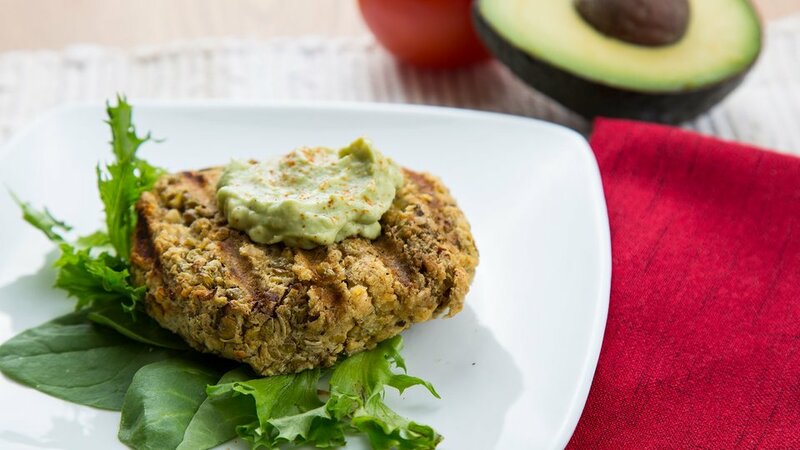 Serve lentil burgers topped with mashed avocado mixture.